We landed on 25th Sep’15 afternoon at Eleftherios Venizelos Airport. The immigration process was pretty quick and our backpacks were among the early ones to come out. We downloaded the GreekGuide app (works offline too) for Athens and other cities which has all important information one might need for the trip. As we landed we saw Ikea which was bang opposite the airport. Since my husband had never been to one, we thought we might as well have a look at the shop and then proceed to the city. We took X95 bus at the entrance of the Airport, spent some time at Ikea, picked up a few things and then waited to board X95 again to get to Syntagma Square. We had booked our stay with Nikolas through Airbnb and this property is close to Metaxourghio Metro Station. Took a taxi from Syntagma to find our place and checked in at about 1600hrs. Nikolas was a nice host and his place was perfect (Acropolis view from the balcony) making it a great start to the eight day long vacation. We stepped out in an hour and headed straight from Metaxourghio to Acropoli Station using the metro. Upon reaching Acropolis, we walked all the way up starting from the Theatre of Dionysos, Herodes Theatre, Temple of Athena – popularly known as the Parthenon and the Erechtheion. Our timing was perfect – it was around sunset and the rays bounced off the Acropolis and the city beautifully! We headed to the Museum from there and got to know more about the city, lifestyle and the Acropolis. They have restored and maintained the ruins extremely well that it takes you back in time and makes you get lost in the world of history. Hunger pangs were on by this time and as suggested by Nikolos, we walked to Monastiraki. (Youcan take the metro to reach from Acropoli to Monastiraki.) This place was one of my favourites as it was bustling with people who were either hanging out, dancing or singing; so many places to shop and beautiful looking restaurants to dine – the perfect place to spend some great time that night. We started by 0930hrs, had breakfast at a coffee shop in Metaxourghio, took the metro and went to Acropoli station. We started the day with the Temple of Zeus, the National Garden which was quiet and peaceful, Panathenaic Stadium which hosted the first modern Olympics, Ancient Agora & Roman Agora and the Temple of Hephaestus which is almost intact. Post lunch our plan was to go to Mount Lycabettus which gives you the most beautiful panoramic view of Athens and end with Kerameikos Archaeological Site. For Mount Lycabettus, there are two ways to go all the way – climb or use the Teleferik. We chose the latter as we had walked enough for the day. There is a small restaurant and a St. George Chapel on top. After enjoying the panoramic view of the city, we descended and went to the metro station to Kerameikos. This area, which is to the north of Acropolis, was used as a cemetery and is along the banks of the Eridanos river. The museum at the site has burial related artifacts. After hanging out with with Nikolas for some time, we left to Monastiraki (you know why :P) and had dinner at Plaka. We loved the energy and the vibes of this city, so before leaving to Sthamos Larisis Train Station (to Kalabaka), we spent some time at the Syntagma Square. 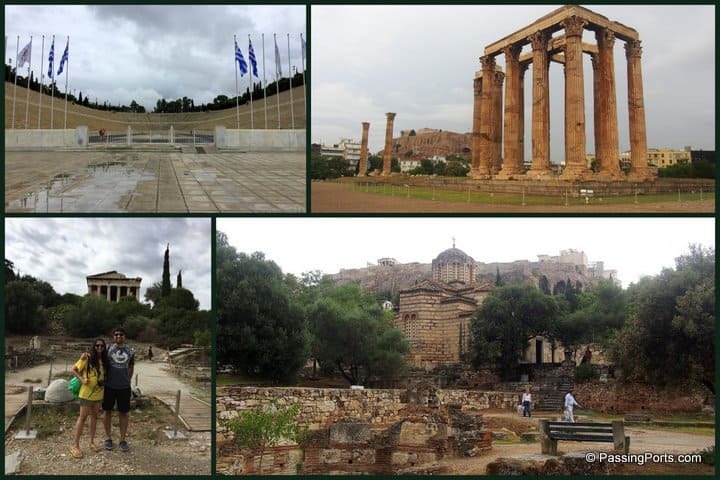 We spent 195€ for two days in Athens – includes stay, shopping at Ikea, souvenirs, umbrella and raincoat due to sudden rains etc and the above mentioned expenses. WiFi is available for free in almost all the coffee shops/restaurants. TIP: As the last week of September – every year is celebrated as the European Heritage Days or Cultural Week, the last weekend is free entry to all Archeological sites. Meteora was our next destination. To know more on how we spent our time there, click here. To know how I planned for Greece, click here. To know the complete itinerary of eight days in Greece, click here.